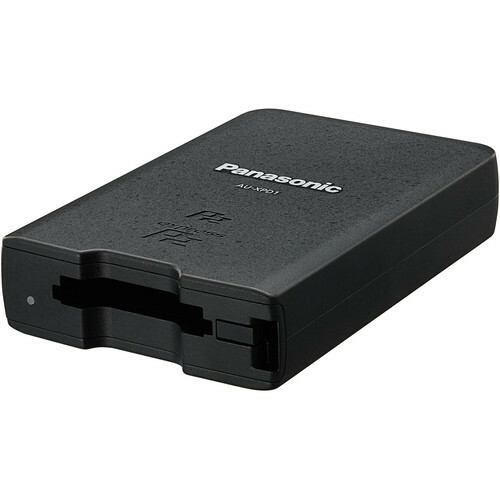 The Panasonic AU-XPD1 P2 Memory Card Drive is a compact, single-slot P2 card reader/writer that uses a USB 3.0 interface, which is fast enough to accommodate expressP2 card data transfer rates up to 2.4 Gb/s. It is compatible with P2 and expressP2 memory cards, as well as microP2 cards when using the optional AJ-P2AD1G adapter. Two USB 3.0 ports are provided on the device; one for transferring data and one for powering the device from your computer or an AC adapter. For computers without USB 3.0 support, the device is backwards compatible with USB 2.0.